Club Monaco is one of my favorite places to shop, but mostly for two specific clothing items: gorgeous coats and cozy sweaters for fall/winter wear. While I’d like to say I shop the entire store, I have to admit most of their dresses, skirts and jumpsuits run a little narrow and short on me. You’ve heard me praise their selection of winter coats a bunch of times before, but I’m not sure I’ve spoken at length about my love for their knitwear. Not only are the sweaters high-quality, the fit is great and the styles are both wearable and on trend. From simple layering basics to more dramatic styles like this cape sweater I wore here, Club Monaco has something for everyone! This season I picked up three new silhouettes from them, including the aforementioned cape sweater, this sophisticated mock neck style and the pretty grey turtleneck you see here. 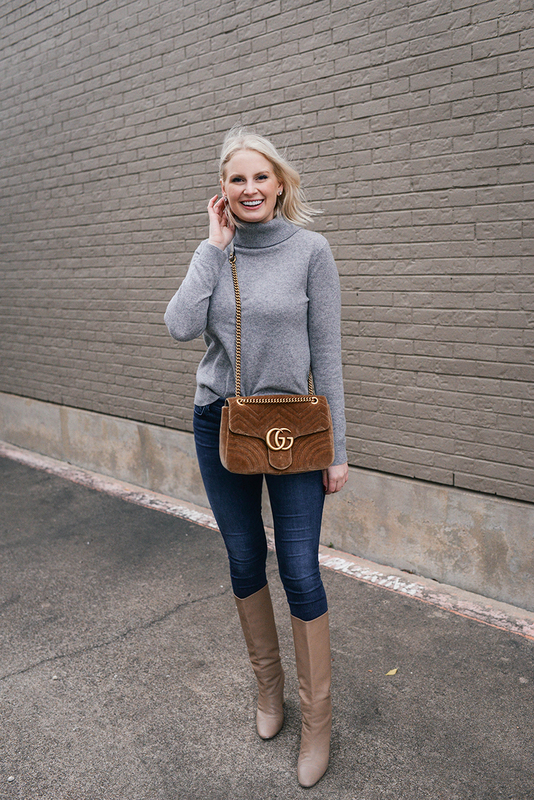 While this sweater is obviously a nice staple, it’s the pretty gold buttons on the back of the neck that make this cashmere piece so special. Club Monaco has always had an eye for details, and this sweater is no exception! SHOP MORE OF MY FAVORITE CLUB MONACO SWEATERS BELOW! This mock neck sweater comes in two gorgeous colors, but I’d probably go for the Marble hue. Such a great neutral! The ribbon detail on the sleeves of this sweater is stunning! Would look super cute with white jeans going into spring. This winter white poncho sweater is a beauty too, and features shearling cuffs. So fab! If you’re looking for a chic cardigan for the season, don’t miss this leather-trimmed look! Love the button detail on my sweater I’m wearing in this post? This similar style is a mock neck but features similar buttons on the sleeves! This simple ribbed knit looks super cozy and like something you’d wear every day. Style it under a faux fur vest with jeans and flat over-the-knee boot! Club Monaco seriously has the best sweaters! Love this outfit!